I do not know which is more unbelievable–that the humans have friends or that the humans’ friend would drive in from another city just to have lunch with them. I myself cannot usually be bothered to cross the room to dine with them, but perhaps, as they say, familiarity breeds contempt. Perhaps the out-of-town friend, not having lived with them, is not privy to all of their not-so-charming little habits. Ah. The friend has come to town to watch a football game. Lunch is just an afterthought. That makes more sense. There are other people coming along too. I’m always glad of an opportunity to study human nature and recruit some more minions, so the more the merrier. We have not been to this restaurant before. It apparently specializes in just part of a chicken–it says so right on the silverware packet. The humans say that they are a delicacy, but surely this is some sort of joke the locals play on visitors! Be careful, guest-from-out-of-town! Your “friends” are trying to poison you! And here is the food! Hmmm. It consists mostly of fried things, which seems to be the preferred method of preparation for anything except breakfast cereal in this part of the realm. I am quite relieved to see that they are merely little strips of beef battered and fried, served with a creamy white gravy and some thick toast. Sigyn is very fond of toast. (poke, poke, poke) I wonder what these “fingers” taste like? Sproing! Ehehehehe! 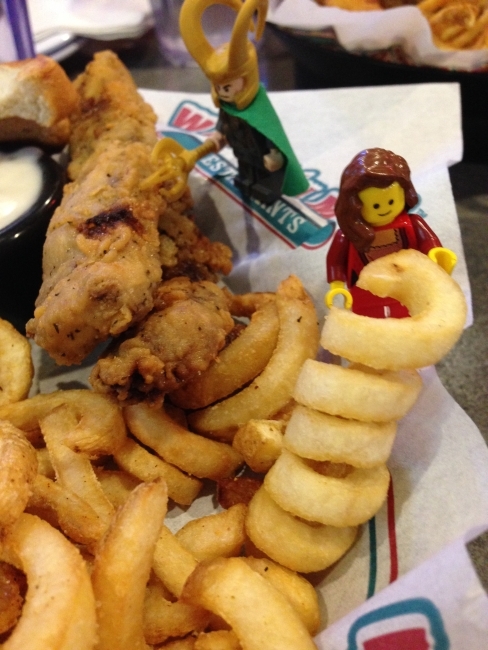 Sigyn is having fun with the curly fried potatoes. 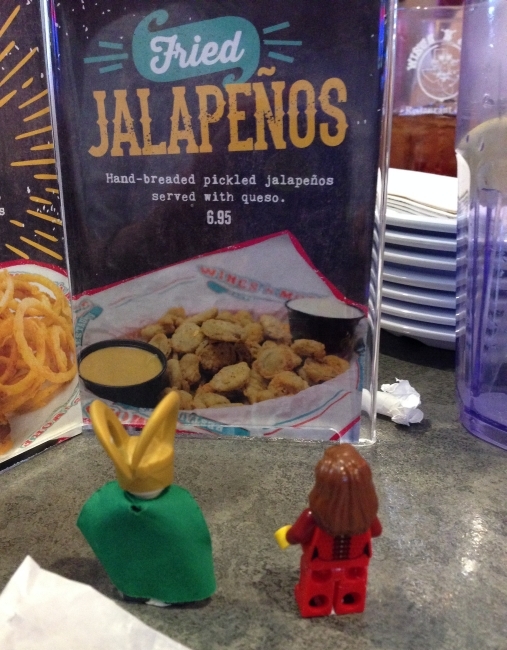 Frigga used to chide Thor and me for playing with our food, but when it’s this silly, I can see that it would be impossible to resist. Sprooooiiing! Obviously this restaurant is mis-named. It ought to be SPRINGS and More! 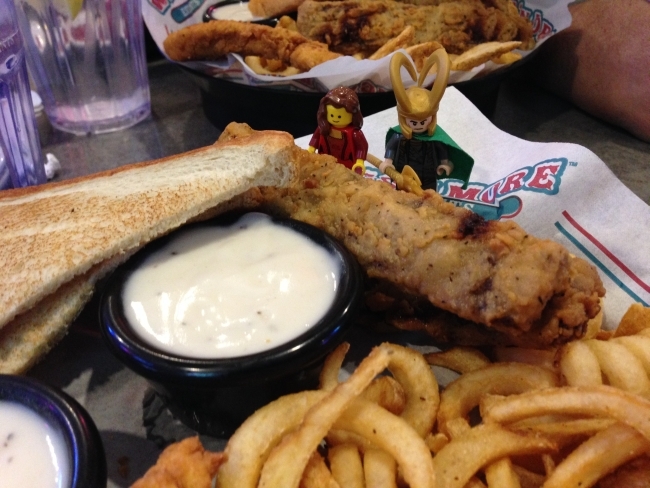 Last year, my celebration of the Midgardian feast of love and romance did not go very well. I swore never to participate again. This year–Oh, this year I am celebrating with my beloved Sigyn and I couldn’t be happier. 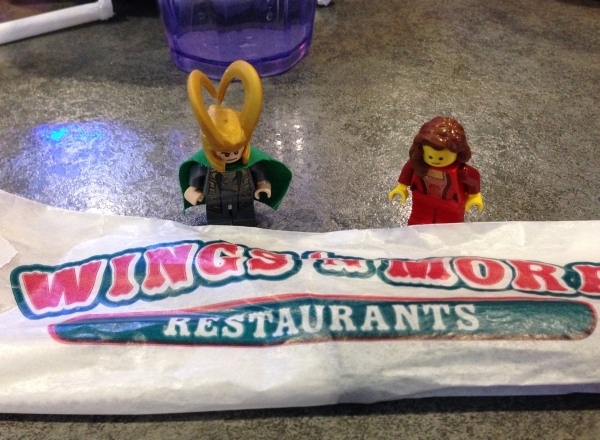 It is customary to dine out with one’s partner on this day, so I have brought Sigyn to one of the town’s nicest restaurants. We had a nice ride over here. (I like it when Sigyn rides pillion–it’s a ride with a built-in hug!) There was rather a wait to be seated, but a well-placed glower convinced the hostess to move us to the front of the line. (I told her Sleipnir was a service animal.) Now we are perusing the menu. I shall order the Straw and Hay for Sleipnir (without the prosciutto.) Sigyn, of course, zeroed in on the Red Fish. I think I will try the Poblano Mac and Cheese, because I am given to understand that, like a certain god I know, poblano peppers are green and spicy. …and play hide-and-seek with the tableware. Sigyn, I don’t think the water carafe is as opaque as you think it is. Nor is the candle holder. Dearest, come out of there. The waiter wants to light the candle. This is so romantic. The food is delicious, and the company couldn’t be more charming. Even Sleipnir is behaving beautifully. There is always room for gelato!